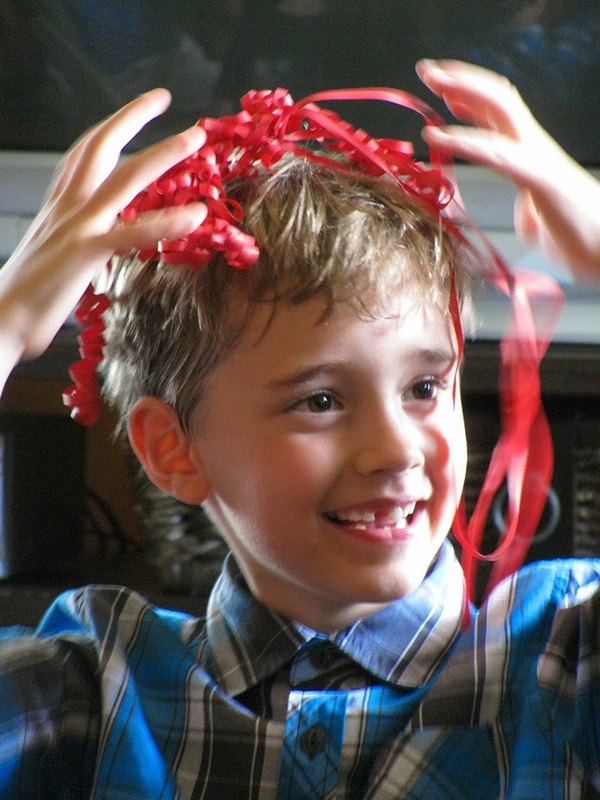 Over the weekend we had my nephew Evan and Isaak's birthday party at our house. Next year 1 more May birthday will be added to the mix. My nephew Edison will be the one added to the mix. I was holding Edison, and his brother Elijah (age 6) said, "I think he likes being held by my family only." Eljiah was biting his lip trying to tell me how to hold him. Elijah was all dirty from playing outside, so my sister wouldn't let him hold his brother. The reason why Edison was crying was because he was hungry. Elijah sat across the room giving me the stare down. I couldn't help, but laugh. His brothers are protective. The other May Birthday boys had a blast. They took turns opening up gifts. 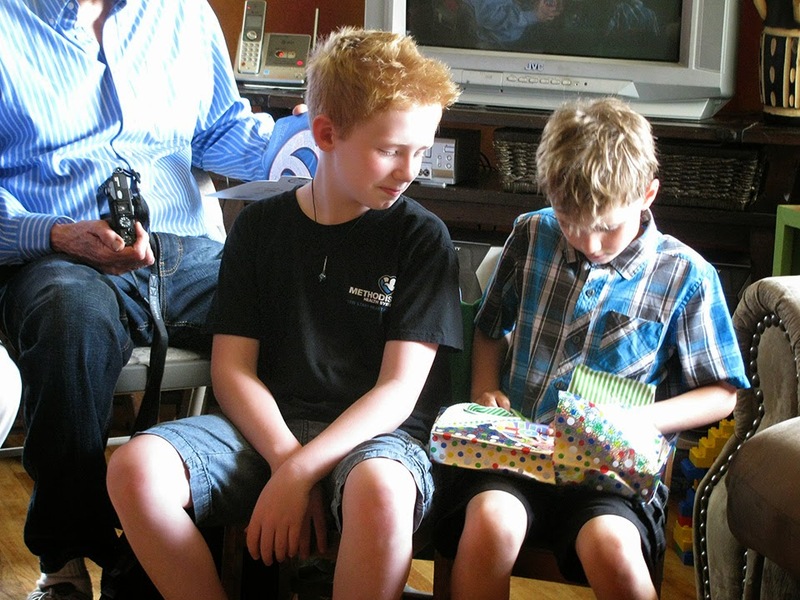 My nephew Evan is the red head and son Isaak. 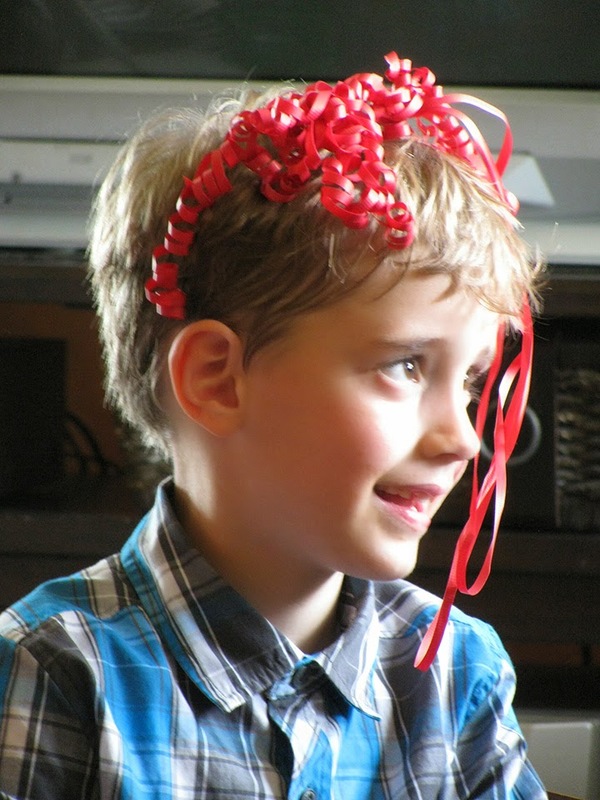 Isaak had the most fun wearing the ribbon on his head. I love Edison!! He is precious. Just waIt. In a few years it will be, "No one can hit my brother but me." It's really great that you all live close enough to be an extended family. My kids only know their cousins from a brief visit the boys made way back in 1995. We live back here, all the rest of the family is in California, Oregon, or Idaho. Sounds like a blast! Happy Birthday! Oh your nephew is adorable !!! How fun to have so many birthdays in the same month. Makes celebrating so much easier, I think! Happy birthday to the boys! 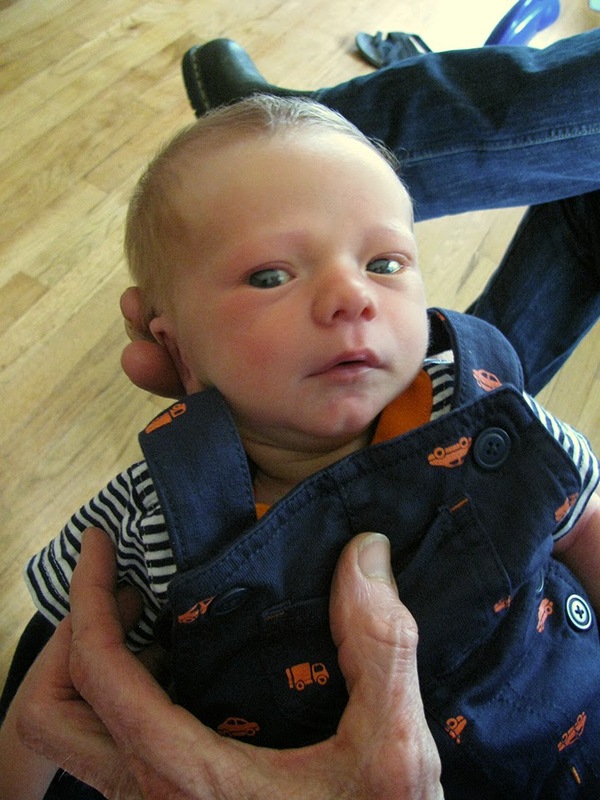 And welcome to the world Edison. What a cutie! What a fun party, Happy Birthday a little late. Cute baby too!!! Take care have a great week!! Awe! Happy Birthday! What fun! Such adorable boys! Hope everyone had a wonderful birthday. My girls are always sad that their cousins are so much older (the youngest is already in his 20's)--it's great to have big family parties with all of the kids playing together! What a great family gathering. That is really fun and a happy birthday as well. They grow up so fast! Enjoy the time!